The aim of the study was to investigate the antidiabetic effect of the traditional Vietnamese herb Gynostemma pentaphyllum in 24 drug-naïve type 2 diabetic patients. All patients were randomized to authenticated Gynostemma pentaphyllum tea or placebo tea, 6 g daily, during twelve weeks and received information regarding diet and exercise. Fasting plasma glucose, insulin levels, and glycosylated hemoglobin (HbA1C) were measured before, during, and after the treatment. Oral glucose tolerance tests were performed every four weeks. After 12-week treatment, fasting plasma glucose levels totally decreased to an extent of 3.0±1.8 mmol/l in the Gynostemma pentaphyllum tea group as compared to a decrease of 0.6±2.2 mmol/l in the control group (p<0.01). HbA1C levels after 12 weeks decreased approximately 2% units in the Gynostemma pentaphyllum group compared to 0.2% unit in the controls (p<0.001). Change in Homeostasis Model Assessment-Insulin Resistance between baseline and twelfth week indicated that insulin resistance decreased significantly in the Gynostemma pentaphyllum group (−2.1±3.0) compared with that (+1.1±3.3) in the control group (p<0.05). There were no hypoglycemias, or adverse effects regarding kidney and liver parameters or gastrointestinal function. In addition, lipid profiles, glucagon, cortisol levels, body measurements, and blood pressure were not different between the groups. 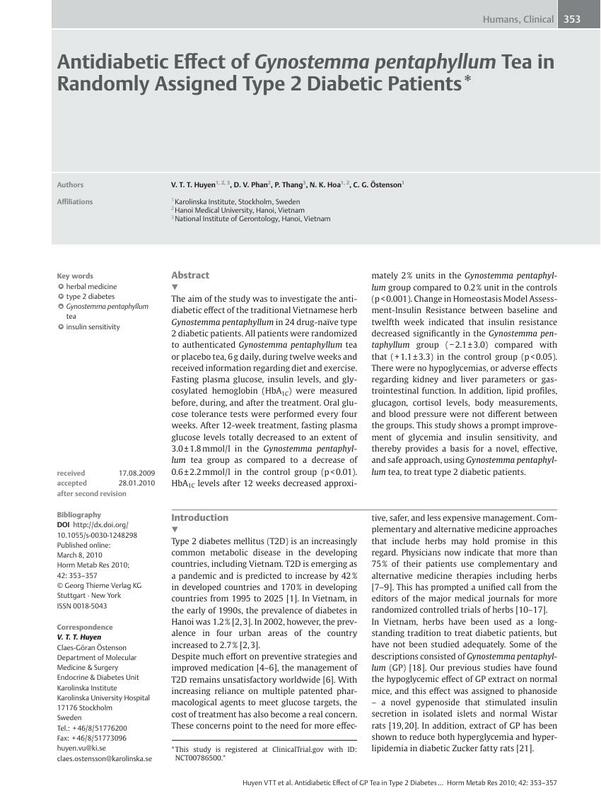 This study shows a prompt improvement of glycemia and insulin sensitivity, and thereby provides a basis for a novel, effective, and safe approach, using Gynostemma pentaphyllum tea, to treat type 2 diabetic patients.